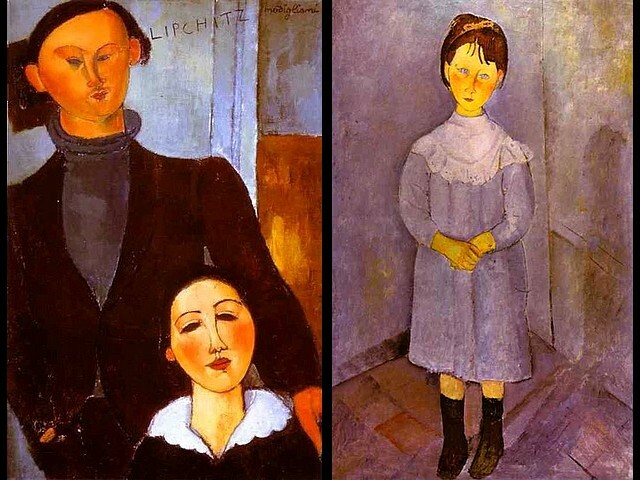 The famous painting which Amedeo Modigliani was worked for nearly two weeks, the longest time for a portrait, only for ten francs - 'The Sculptor Jacques Lipchitz and His Wife Berthe Lipchitz' (1916, oil on canvas, Art Institute of Chicago, Illinois, USA), depicts his close friend from Jewish background, newly married, a sculptor and an example of artistic industriousness, from the same artistic circle in Paris. In 1920 he creates the death mask of Modigliani. 'Girl in Blue' (1918, oil on canvas, private collection in Paris), is an unusual portrait of a little girl, standing stiffly in the corner, with large blue eyes and a face that radiates innocence, made in delicate blue tones, an authentic masterpiece of painting.